Quoted from an ARC. All the quotes will be checked against a final finished copy. Sometimes Cass wished she could throw herself into the lagoon, feel the cool water on her skin as she swam away to freedom. But she couldn't swim. She was weighed down, drowning; her whole life was pulling her under. 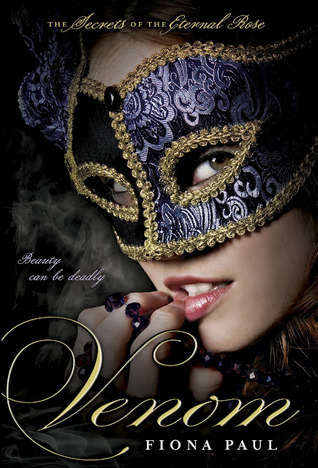 Set in Renaissance Venice, Venom is a fabulous YA historical fiction and one that I instantly fell in love with. Blending together romance, mystery, family drama and lush historical setting, Fiona Paul weaves a compelling and highly addictive plot line full of thrilling events and dangerous encounters. Featuring mutilated corpses, secret societies, a mysterious (and seductive) artist and a steaming romance that is just as exciting as it is forbidden, Venom is a phenomenal beginning to a new and gorgeously imagined YA series. What an absolutely fantastic read! I devoured it in just one day! Venom is full of delicious kisses and steamy love scenes. The chemistry is almost unbearable (in a good way!). Paul's descriptions are amazingly detailed and they're sure to make you blush. If you're a kissing enthusiast you will love this book! And the best part is, even though the characters are almost instantly attracted to each other (whether they admit it or not), the romance builds up at a very good, not-too-fast pace. Spiced up with danger and mystery, it's one of the most swoon-worthy books I've read this year. Hot! Venom's heroine is strong and that's a quality I always appreciate in characters. Engaged to Luca de Perega (an arranged marriage that has nothing to do with love and affection), she's a high-society girl who always has to look and behave flawlessly. Don't let that fool you though, Cass is the exact opposite of a pampered girl. She's down-to-earth, clever, modest, impetuous and very curious. Having lost both of her parents at a young age, she's emotionally mature, but also a little bit insecure and yearning for love. Personally, I thought she was a great character - easy to like and sympathize with, relatable, authentic. She isn't a flawless person, but one that learns and grows a lot as the story progresses. Falco, oh Falco! What a gorgeous, swoon-worthy hero he is! Handsome, mysterious, funny, witty and just a tiny bit cocky, he's as charming as Casanova and as romantic as Romeo. He's bold, brave and quite unpredictable. Girls beware, this guy will steal your heart! I loved everything about this book. The historical setting was vivid, beautiful and mesmerizing (and obviously well researched). The characters didn't feel like characters at all, they felt real and convincing. The plot line was surprisingly unique, often scary and scandalous, full of romantic tension, fast-paced and dream-like. Paul's attention to details - from the 16th century Venetian gowns, corsets, braided hair, gorgeous jewellery and expensive fabrics to vibrant social life, customs and masquerade balls - was simply stunning. I loved every single page of this book and would recommend it to everyone. It's a must read not only for fans of historical fiction and suspenseful mysteries, but for anyone who appreciates skilful world building and excellent prose. I have heard numerous times that Venom is a must-read. I have been hesitant because I don't always love historical fiction. It has to be more than that for me to love it. Venom sounds like it has so much more than historic's. So I am going to read this one by golly! Thanks so much for yet another review! Great cover art. I'd pick that up from a shelf. I don't read too many historical fiction, but from what I can tell from your review, it doesn't have supernatural elements in there. Sometimes, a girl just has to read something non-paranormal, y'know? Can't wait to pick this up! Adding it to my wishlist. Your review has peaked my interest. I love historical fiction and haven't read a really good one in a while. It might be the kind of book I need to get over all these books I have DNFed. I've been eyeing this book for quite sometime now. Can't wait to read it! sounds a book I'll enjoy. This sounds fantastic!! I have been wanting to read it and after your review I am totally pining for it! However shall I review this book when you just said it 10x better than I could! It was an awesome read and so much to enjoy... Especially Falco *sigh* Awesome review! Steamy love scenes and a good mystery? Ugh, you have me sold. Lol! Glad to hear that the mc is strong, it's a quality I always appreciate too. I am not a historical fiction fan at all but you make me want to read this one. The cover is also really beautiful. I am so freaking excited to read this one. Pre-ordered it a while ago. Great review! WOW amazing review. I just received this book in the mail this week and after reading your review I think I need to read this ASAP! Gorgeous review! I completely agree, this was a fabulous read! Loved the setting and the romance was perfect! I have had Venom on my to-read for a while but I still haven't read it. Great review! Can't wait to read it! Seems great!! Now I'm adding it to my wishlist. Wanna read it. And Venice... hmm... the setting itself is already promising great story.